Writer, feminist researcher, and market organiser, Dudziro Nhengu (Zimbabwe), interviewed Malawian activist, Tiwonge Gondwe in Istanbul, Turkey (April, 2012). Tiwonge, please tell me about your relationship with JASS? I knew JASS in 2008 in Cape Town. We had a meeting and I was with our partner Action Aid. 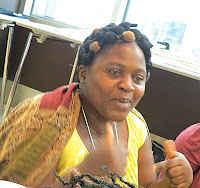 It was a big JASS meeting, another CRD with people from all over – to discuss possible partnerships between JASS and Action Aid to mobilise and make change happen. Action Aid was partnering the Coalition of Women Living with HIV/AIDS, of which I am a member. We had different dialogues, role plays and skits, on any topic affecting women. The space there was a safe space for discussing who is making decisions, why and how. I went back home, but the aura of JASS followed me and stayed with me. It was the first time I had discussed issues openly and differently, and the only time a donor had given me space to say what was in my heart and on my agenda without dictating the pace for me. I started seeing through and critiquing many relationships between donors and their partners. I saw clearly that so many organisations in my country are pushing donor driven agendas. It’s the donor who decides what to do and because our country is poor people rush for that. Women can do anything, things not coming from their hearts. They just do the work in order to convince the donor. Are you still a member of Coalition? Yes I am, since 2006, when it was formed. Why did you join this organisation, and what agenda to you drive? I joined the Coalition because I am a woman living with HIV/AIDS, and also because of the violence I have undergone at the mercy of my former husband. I knew that no one could speak of me and for me without me, so it had to be me in those spaces. My agenda in the organisation is to make the needs of HIV positive women visible, according to what the women themselves want and not from the donor’s perspective. HIV positive women want proper and quality medication so that they can live quality lives and raise their children. The irony is that the Coalition was formed as a result of some donor agencies who came to Malawi and mobilised us to form this organisation. We thought they had our interests at heart and we joined them in partnership. They did nothing to help us and most of us are now deformed when these donor agencies are they. They did monitoring and evaluation of their theories, but not of our lives. If they monitored our lives how come we are all deformed and they are doing nothing to help us regain our health and dignity. It was only JASS that came in later and started addressing the issue of us getting quality medication. What do you mean you and HIV positive women in Malawi are deformed Tiwonge? I am talking about the side effects of ARVs. The ARVs have three substances, Trimoume 30, Stavudin and Nevirapine. These three substances combine in one pill of ARVs. It has been discovered that Stavudin deposits a lot of fatty substances in our bodies, and we end up with growths on different parts of our bodies, like humps and mumps. We also get scars, pimples and bulging tummies. The donor who founded that organisation is there and doing nothing for us. It was JASS who came in and asked us what was burning in our hearts, then we started addressing the issue of deformation from ARVs. JASS has taught us how to put our voices together for collective action in order to name and shame the government, as well as to lobby for better quality ARVs. We want our dignity back. You seem to be angry with your government Tiwonge, tell me more about this person called government. The ARVs we are receiving are provided free by government, we don’t buy them – they are a public service. Why is the government not providing all that for us as women? First there is corruption, which has led to poverty and also to Malawi losing support from other donors and agencies like DFID who were giving us a percentage of money towards health. Our bad governance during the reign of Bingu waMutharika cost us a lot of development privileges, the IMF and World Bank also withdrew their support and with our taxation and poor economy, our government found it difficult to buy the second line drugs because they are a bit more expensive. The current ARV package in Malawi is rotten pie, and it is the women who are eating the biggest chuck of that rotten pie because we outnumber men in population, and also in infection statistics. Some men are rich and can afford Line 2 ARVs under the private scheme, many women cannot. We hold the government accountable because it is their duty to ensure that we get quality healthcare, which is enshrined in MDG 6 on combating HIV/AIDS, malaria and other diseases. Please tell me what you want Tiwonge? I want so many things as a woman. I want my government to commit to what they have ratified on access to quality healthcare. They must practice that on the ground. I want those ARVs to be changed and it must not be a policy thing to say we must change only TB and PMCTC drugs, what about the rest? What change has JASS brought to you and to your organisation Tiwonge? The changes are many. Personally it is the strength and power within me. I now know that I have power within myself, and power with others too, and that I can transform my individual power into a collective power to drive change in my family, community and nation. Power, Tiwonge, can be understood in different ways. Where does your power lie and of what use is it? My power is within me, but it is also with others for collective action. I have already started utilizing the power in two areas of my life. The first thing is that I engaged our MP who is a policy maker, fearlessly, and for the first time in my life. I had meetings with him together with members of my organisation to demand our rights from him, like rights to resources in what we call the Constituency Development Funds (CDF) back home. We know about those funds, and that they are ours. We voted for him in trust to serve our needs. We were demanding access to those resources, the CDF. We were also holding the late president accountable because he stood on the podium in our community and said that he will upgrade our secondary school to be a full boarding school with all facilities but since the time he talked those promises he hasn’t been able even to come and talk to us. We want our CDF to be used according to women’s rights issues. The second thing has to do with my personal life. I have managed to challenge my husband using the law to gain my freedom from violence. I shocked him; he never thought I would do it. Look Dudzi, I am not an educated woman like the rest of you. I am an ordinary woman from the village and the first time I met JASS I could not speak one word of English correctly, it was also coupled with lack of confidence. Look at me now, I am right here in Turkey, I represent myself and speak for myself. Today at AWID I gave a presentation of the issue of HIV/AIDS and treatment of women in Malawi. This is huge change. JASS has given me a second life, a good one too. We have heard about change of government in your country, does this mean anything to you? For me it means a lot. I feel two things, I feel better and also threatened; better because to have a woman president is good for us as women. There is no problem and nothing to hinder us from reaching her with our issues as women. It is our opportunity and our strength. She is also a gender activist well known to us, and women have shared platforms with her before. Even when we voted for Bingu we expected her to be the Vice President since she was the fore-runner for the president in the campaigns. She did all the campaign for him and he identified her as the vice president but after winning it was evident that he was just putting her in front to gain women’s votes because the number of women in our country is high, so it was a political gimmick. At first she had all incentives as president but later he started abusing her, calling her bad names, grabbing all incentives and it was messy. I feel threatened because of the dynamics there in Malawi currently, since Bingu’s death. There are rumours that a lot of political men and women in the DPP are running away from DPP to join Joyce Banda again. This for me is opportunism. Why are they running away? Where were they to advise Bingu? What change will they bring to Joyce Banda, except to exercise their paternalism and find ways of taking over? Men always have set agendas, to take over and perpetuate patriarchy, I feel threatened. They should leave her to navigate the space on her own, we need new thinking. Why do they assume that a woman cannot make it? In my country the political culture is one of opportunism. They are the same people who were in MCP, they ran to UDF, then to DPP and now they are joining Joyce Banda. They are carriers of confusion. I am a feminist activist. I call myself that because I have brought many changes in people’s lives, starting with my own. Since I tested HIV positive there was a lot of stigma in my community. My own brother was discriminating against me but I did not let that destroy me. I stood strong. There was no one to come and open up about their status but I managed to start a support group and through that people learnt that HIV is not a threat but like any other disease if you take medication you can live happily. I faced violence from my husband for so many years. Last year I quit the marriage and am at home alone. With the little resources I gain from farming I managed to build a house in my father’s homestead and I live happily with my children, I have four children. I don’t want to see people suffering in silence. I don’t want to see women crying. Women should speak out and find ways or strategies to use to achieve their common goals. From this AWID meeting I have gained a lot. This is my second time in AWID through JASS. After working with so many organisations for so many years but the only organisation that brought me out of my country was JASS. I appreciate and don’t take that for granted, but am really thankful. I have leant a lot. I am happy because I was able to present at a JASS session today, in front of women from all over the world. JASS is helping me gain confidence and knowledge. "I realised myself and started using the power inside me and asked myself a question, “If I am the person who teaches my fellow women about legal frameworks, and I am staying in violence, I can pick a woman to say you go to court, to the chief but why can’t I myself go to court to claim my rights? I said to myself change should begin with me so two years ago I went to court and got a protection order." Interview by Dudziro Nhengu. Read more of Dudziro's work HERE.